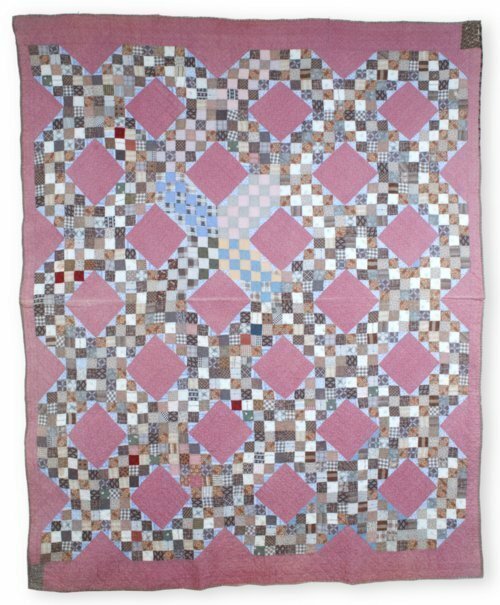 Cotton quilt pieced in variation of Double Irish Chain pattern. Pieced blocks feature mostly brown or tan prints, and are edged with triangles in a light-blue print. Pieced blocks alternate with whole pink squares. Two opposing corners have a small piece of brown printed fabric at the border. Hand-stitched and -quilted in a grid design overall. Brown print binding. White cotton batting and backing. Initials "E.D.C." are handwritten in ink on back corner, and indicate the owner, Elmer Dwight Copeland. This quilt was made by Emma Cartwright Copeland (b. 1865 Indiana, d. 1944 Kansas) for Elmer who was her son and only child.